The college graduation rate for students with LD is about half that of the general population (28% versus 56% of students that start college). According to the Institute for Higher Education Policy, this poor showing is largely due to education missteps that begin in elementary school and continue through high school. 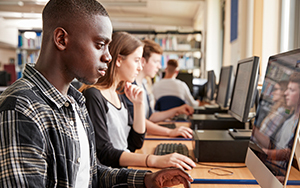 From kindergarten through grade 12, students with LD experience “inadequate academic preparation compared to their peers without disabilities; lower academic expectations; inferior pedagogy and services; and lack of full access to the core curriculum.” Furthermore, high school guidance counselors, teachers, and even parents focus on college admission rather than developing the skills needed to succeed once there. Pressure from parents and/or peers: Despite lack of ability, desire, readiness, or adequate knowledge of strengths, weaknesses, and interests, many enroll in college simply because they don’t have an alternative plan. But to achieve success in higher education, students need a reason other than “everyone else” is doing it; they must be motivated from within. Semester vs. year: The college workload is faster, heavier, and more difficult than what they’re used to in high school. It requires more time, organization, and a greater mental commitment. In addition, because a semester moves so quickly, students often don’t recognize they’re in academic trouble until it’s too late. Responsibility shift: Prior to college, parents take the lead in looking out for their child’s best interests. In college, this burden falls to the child who, until now, has played a passive role. This dramatic change is often underestimated and requires self-advocacy skills, which have yet to be developed. IDEA vs Section 504: Students with disabilities in high school are covered under IDEA, the law that provides an individualized education plan (IEP). In college, IDEA vanishes and Section 504 takes over. The support to which students have become accustomed is suddenly pulled out from under them. Under Section 504 the safety net is smaller, guaranteeing only non-discrimination through accommodations. Exams: In high school, teachers often test students on every chapter, forcing frequent review and diminishing the weight of each exam. Extra credit may be offered to compensate for a poor grade, and attitude may be factored into final grades. In college, a student often has just two opportunities to influence his grade—a midterm and a final exam, leaving little room to compensate for poor test performance. Time management/organizational skills: While most students can’t wait to escape parental nagging, they arrive at college without a system that replaces parent-imposed structure. They haven’t learned that a weekly/monthly academic planner is essential to managing their time in college. Because college assignments can be long-term, they need to be planned up-front, allowing sufficient time for completion, while not conflicting with responsibilities in other classes. It’s a delicate balancing act many are unprepared for. Study skills: Most high school teachers assume their students know how to study, so study skills aren’t incorporated into the curriculum. Special Education teachers often provide review packets for exams, and test questions frequently come straight from the packet. This translates into good test results with minimal effort. Professors, on the other hand, rarely use study guides. They expect students to ferret out essential information from the emphasis in lectures and assignments. Self-discipline: Here again, high school students have parents to police their actions with required homework, study times, curfews, restrictions on school nights, etc. In college, no one imposes these controls. It takes a strong will to pass up a weeknight party because you have an 8:00 a.m. class the next morning. Navigational strategies: Scheduling classes in college is an art that few disability centers teach. Students may not know how many credits they can successfully handle; that they should take classes when they are most alert; that they need to balance their schedule with challenging/easier courses; how to distribute their courses evenly over the span of a week; when they are in academic trouble, and what to do about it. Poor college fit: Most college campuses today have a disability services office. However, there is great variability in staff size, personnel credentials, and services offered. Still, most offices have one thing in common: the ability to persuade parents they can meet the needs of their child. For parents unfamiliar with the significant challenges that lie in wait, talk of a tutoring lab, skills workshops, and student support groups can be reassuring. In reality, however, college students need at least twice the support they received in high school, rendering the above amenities alone largely ineffective. For some or all of these reasons, students with LD may find the challenges overwhelming. Feeling defeated, they walk away convinced that they’re not college material. In fact, had they known more about the college system and how to navigate it as a student with LD, the outcome would be different. Joan M. Azarva is a college learning specialist who focuses on the transition from high school to college for students with LD and ADHD.